Continuing Courtney’s blog with weeks 2 and 3! Today is our first day of internships! Excitement was radiating off of everyone – many people woke up early in order to make breakfast and get ready for this day! I, for one, was really pumped to get my internship going. I’m shadowing a physical therapist PhD named Dr. Yonatan Kaplan. Dr. Kaplan is the director of Jerusalem Sports Injury Clinic, lecturer at Hebrew University and a physical therapist. I feel like this experience will be such an amazing opportunity for growth and development. Today was our second day in our internships and the first day that I was able to visit the second clinic for my internship! It was a very fun day – one thing that I love about my internship is the variety of cases that I see. One moment I may be observing an individual with a lumbar case, and the next moment I may be observing an individual with a cranial-sacral case. We visited the Lerner Sports Center, where I watched Dr. Kaplan evaluate and treat many patients. That evening, we had a class with Rabbi Cohen who taught us about happiness. Every action we perform is a choice. While we may have anxious, angry or negative thoughts, we choose how we react in each scenario. He told a story of his daughter- who asked for ice cream on Shabbat, however there was none to have. She started complaining , and the rabbi explained to her that no matter how much we complain, ice cream will not appear. Instead of complaining about the lack of ice cream, there are alternative routes one can take – wait to have ice cream until the next day (making the wait all the more worth it), or settle for a cookie. I believe that this lesson is important because no matter how bad a situation may seem, we can always try to see the light in every situation. Today, as well as again experiencing two clinics in one day, I was given the opportunity to help edit a paper that Dr. Kaplan is attempting to publish. This opportunity will not only help educate me on knowledge regarding return to play in post-surgical patients, but it also gives me the opportunity to familiarize myself with the AMA format. In the future if I ever want to publish a paper, I will have to go through this whole process, and getting experience in it now is definitely helping prepare me for the future. 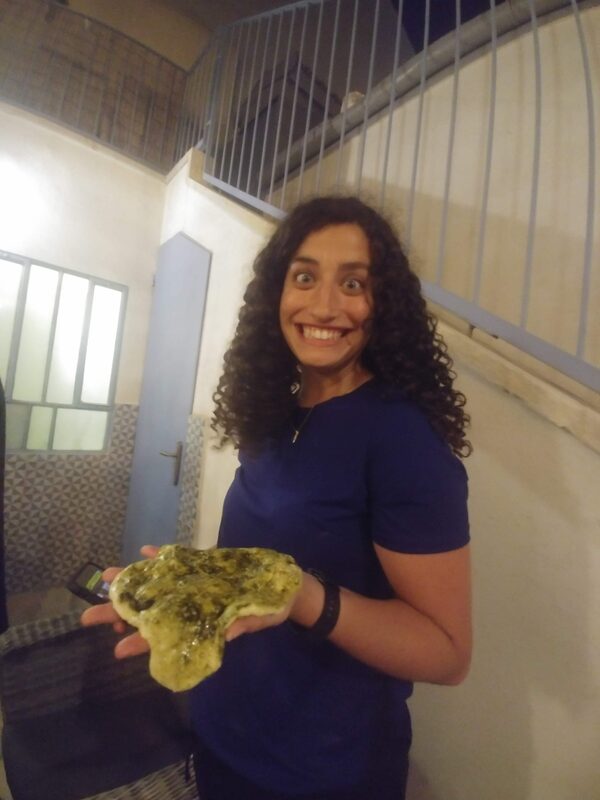 After work, Way More Israel went to Rabbi Shlomo’s house and we went through the whole process of making Lafa. We added flour, salt, olive oil, water, and yeast into a mixing bowl – blending together the simple ingredients that would eventually make a yummy dish! Each one of us got our own piece of dough which we were able to knead into whatever shape we wanted. After putting olive oil and spices on each of our pieces, we put them on the fire to make. Completing the dish with hummus and tahini sauce, we discussed Jewish philosophy on space and time. Today was a great day! We started out the day going to our internships, and then started getting ready for the American Independence Day! Before we celebrated independence day, we first had a discussion with Rabbi Zeldman about what being Jewish meant to us. Is it a religion? Is it a culture? Is it a nationality? We learned that in its flesh, it’s not any of those – it’s a family. Every family has many different members of their family- all from different tribes. Additionally, everybody in the family has different views and interpretations of what being Jewish means to them. It was an interesting conversation we all enjoyed! We started the long weekend by boarding a bus and visiting two different minority cultures in Israel- the Druze and the Circassians. (Check them out here and here!) It was really interesting learning about how Israel dealt with different minority groups. 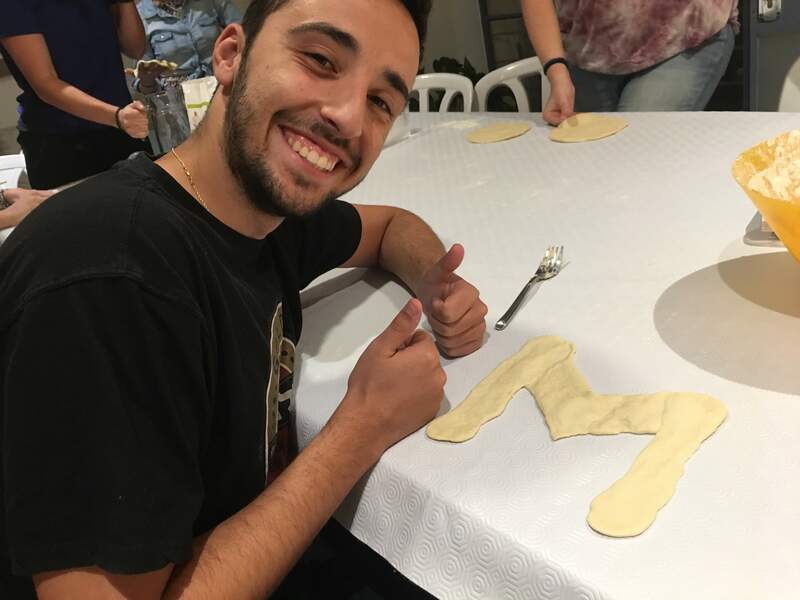 In America, many Jewish people are used to being the minority, and coming to Israel where Jewish people are the majority is definitely a huge change. 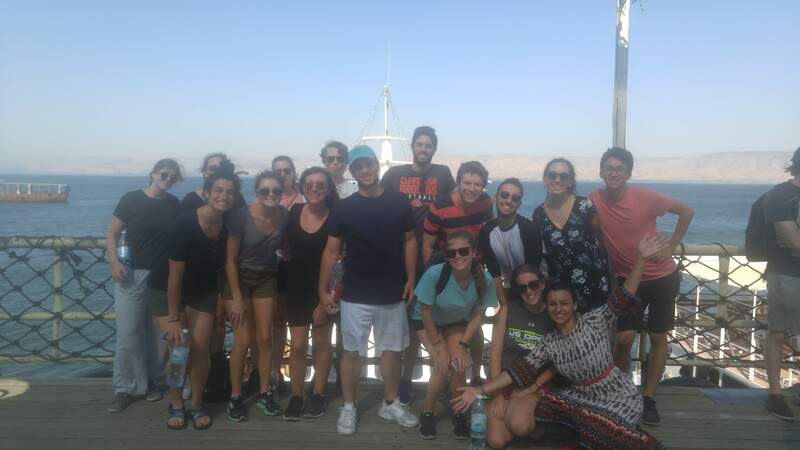 To be honest, I never really considered how Israel would treat other minority groups, and this experience opened my eyes to other minority group’s experiences. On our way to Tzfat, we also were able to spend some time in Haifa. 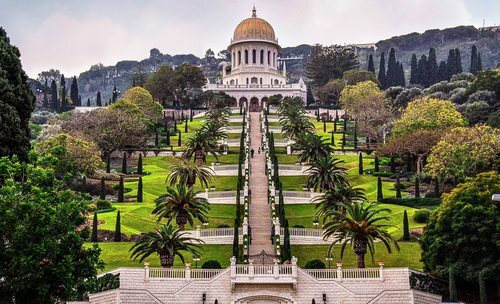 Although we did not have a lot of time there, I was able to walk around the streets, see into the beautiful gardens of Baha’i. It was absolutely breathtaking. In Tzfat, we stayed at a hostel named Ascent. At Ascent, we were able to indulge in a weekend of yoga and meditation. In one of the yoga sessions I attended, the whole session focused on spelling out Hebrew words with our bodies and how those words related to our body’s rhythm and feelings. It was a really introspective experience that I would recommend to everybody. Over the shabbaton in Tzfat, I went to a lovely family’s home. The couple was from New York, and their five children were born in America but raised in Tzfat. 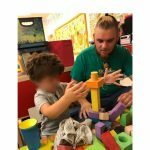 The conversation was always flowing, the children were always entertaining, and the family was extremely warm and welcoming – fostering an environment that sparked conversation regarding Judaism, life, and their experience in moving to Israel. Additionally, many of us explored the art in Tzfat. The jewelry was beautiful, and the paintings were vibrant in color and design. Many of us even got to test out haggling with the local vendors! Tzfat was truly beautiful and I am so thankful that I had the opportunity to experience it! Today was an interesting day because there were many homestays that I was able to go visit. In the homestay, I was able to see how a physical therapist is able to assist a person in order to help them function in an environment that they live in daily. It was truly magical seeing the progress of these patients. Also during the internship today, Dr. Kaplan sent in his article to be reviewed to hopefully be published in the journal. Although my time spent on the article was during the editing process, to see his progress and see how happy he was to submit his work was inspiring in itself. I hope that one day I conduct research that will better the worldwide community as he has done in his past and also today. Like everyday, I feel like I’m really learning from Dr. Kaplan. He is always willing to explain things I don’t understand, tests me on my knowledge, and expresses a passion for what he does that just makes learning from him all the more fun. His patients have nothing but great things to say about him, and being able to have this opportunity is such a fortunate experience that I will never forget. Today is also the birthday of one of the girls on our program, Hayley!! She turns 22 (I don’t know about you, but I’m feeling 22!!). So, everyone on our program celebrated – eating cake, going out, and having a great time!! Overall, it was an amazing day full of friends and fun! 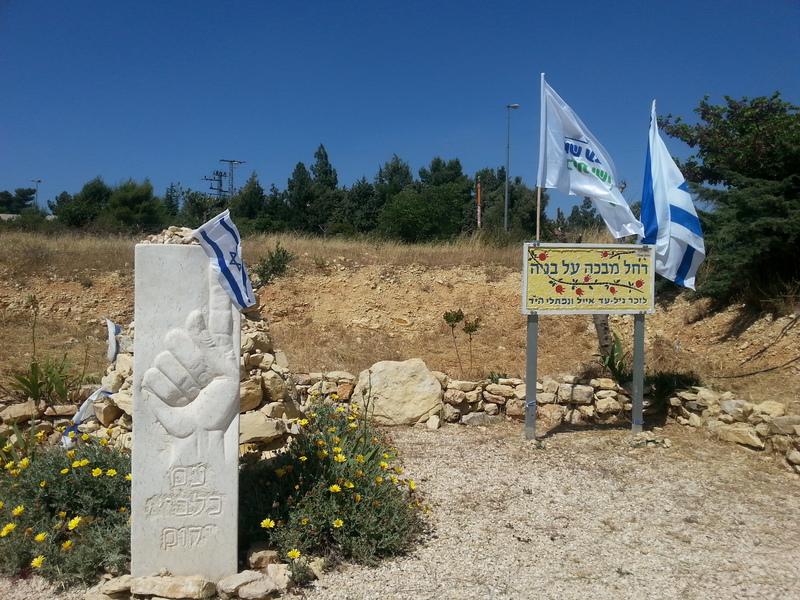 Today we went to Gush Etzion! We started the day at the Kfar Etzion Museum. It was one of the most powerful museums that I have been to since I’ve been in Israel. I learned about a whole entire community that sacrificed their lives in order to live in an area that they believed should always be protected. It was heartbreaking to hear the stories as childrens were separated from their fathers and mothers, and how so many individuals lost their lives for something that they believed in. That raised a question in many individuals – what are you willing to die for? We then visited a park right near a site where three Israelis were captured and murdered. The park was full of obstacle courses, swings, and slides. We learned about all the people that contributed to build the park, and we discussed controversial issues regarding different political beliefs. 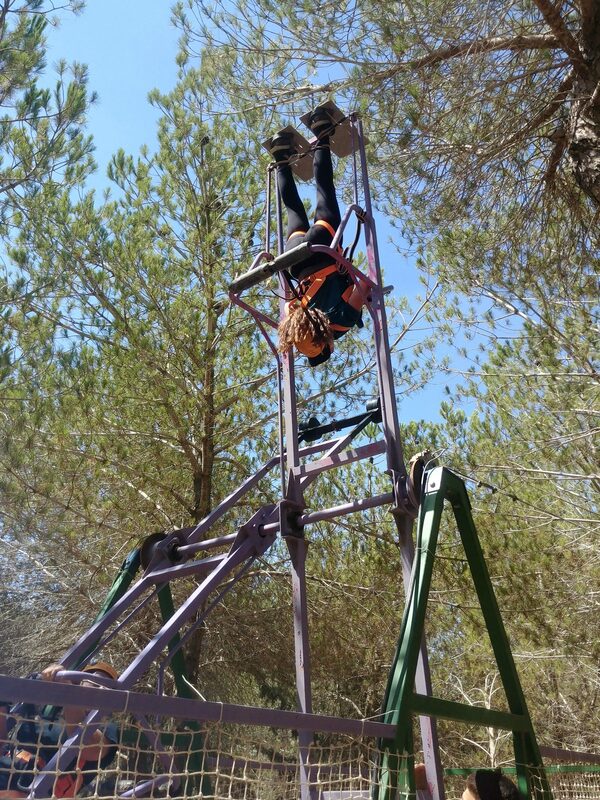 We next went to a park where I was able to watch people go on a 360 swing, rock climbing, and zip lining!! We then returned back to Jerusalem where we heard from three settlers in the West Bank – one Palestinian man, one secular Jewish man, and one religious Jewish man. It was really interesting hearing all of their different perspectives, their different routes to how to obtain peace, and their past experiences in the communities that they live in. It was a really eye-opening experience where I was able to learn about new perspectives that I never thought of before. 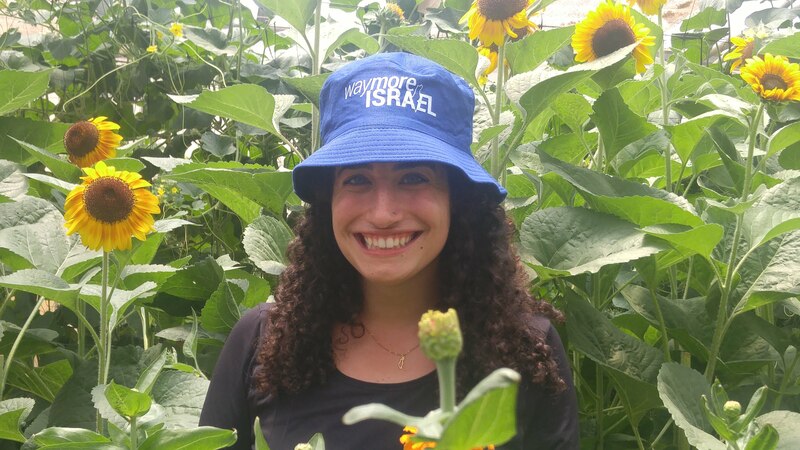 I have been hearing really positive things from my friends about their internships – such as the Israel Project, Hadassah Hospital in Kerem, and Kibbutz Ramat Rachel. Everybody seems to be learning a lot and loving the internship opportunity that Way More Israel was able to provide us. Many people, including myself, understand how fortunate we are to be in the land of Israel and to be able to learn in such a powerful and innovative country. 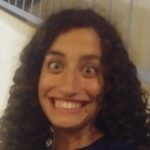 After my internship, I went to my Onward Weekender Event – Activism in the Dead Sea Photography. There I heard from a photographer and activist who has been photographing the Dead Sea for years. In his photos, he captured how the Dead Sea is diminishing slowly but surely. He also gave us a seminar about how important photography and videography is in scary events, such as bombings in Sderot. People are able to record and capture live footage of what is happening. It’s really important to post and spread it around the world so that everybody understands what’s happening around the world and staying up the date on current events. I am so thankful to have been given this opportunity to experience Israel in such a meaningful way!